I was listening to Leon Littlebird and the Yampa Mountain Boys – Steve and John – sing the song “Timberline” in the beautiful setting of the Dillon Amphitheater recently and thought this might be a good series of articles. My next few articles will be on timberline and some of the flora and fauna that live around timberline here in the Rockies. Our beautiful state is widely recognized for its Rocky Mountains and 830 high-altitude peaks of 11,000 feet or more. In Colorado, alpine timberline is found at an average altitude of 11,500 feet. Timberline in the Rocky Mountains of Colorado shows a striking transition between the alpine tundra and coniferous forest. This alpine region is dominated by thick-rooted perennial and prostrate, deciduous shrubs. 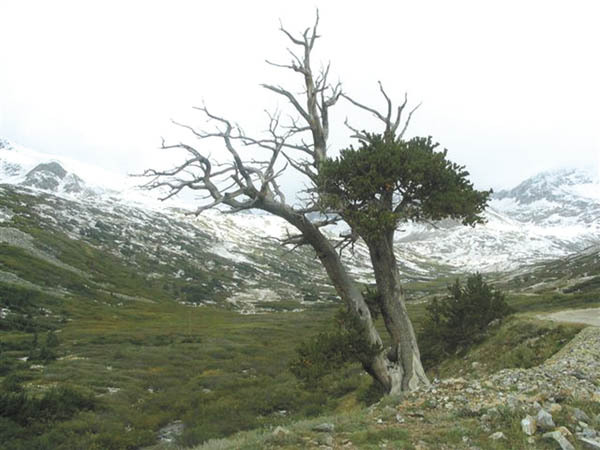 The alpine tree line, which is the border between the subalpine and tundra alpine zones, is the highest altitude at which trees are able to grow. This line is rarely well-defined, and as we hike up we see a gradual change from healthy specimens to stunted, dwarfed growth; nature’s Bonsai. I’ve heard it defined as the boundary at which trees are capable of producing timber-quality wood, hence “timberline.” The average temperature at timberline during the summer months is 55.4 degrees F.
Many of us have hiked the spectacular McCullough Gulch Trail to the high alpine lake – or tarn. One of my favorites! The flowers this year were breathtaking. We saw at least four different colors of paintbrush on the hike up. Did you know that the paintbrush flowers are edible and were eaten in moderation by some Native American tribes? When you reach the lake above McCullough Gulch, you need to start putting on layers. I’ve never been up there when it hasn’t been windy and cold, and it doesn’t usually hit you until you just get to the lake. Last time we were there we had to hunker down out of the wind in the protection of some boulders to have a little lunch. There was still a good-sized snow field in July. I always shake my head at some tourists that wander up in a cotton T-shirt, shorts, maybe a water bottle dangling from their fingers, and no extra clothing or rain jackets. Mountain environments can be very harsh and changeable, and even though it is bright and sunny down in the valley, you can be almost guaranteed a cold wind on top and often a cloud burst. You need to be prepared with shelter, clothing, food, water, and a first-aid kit even for a short hike above timberline.